No matter what type of business you are in, the quality of the products you use reflect on your business. Getting customers orders safely shipped is top priority and finding the most reliable shipping products at affordable prices is job one. eSupplyStore.com provides every client with top of the line products to protect your products and give you peace of mind. Ensuring that our customers's merchandise arrives to it's destination in mint condition is our goal. Our Jiffy Rigi Bag mailers are more than just your average package. These mailers provide unmatchable corner and edge protection with Kraft laminated fiberboard construction that prevents movement of it's contents and resisting bending, folding and creasing. Saving the user money, there is no need for additional stiffeners. 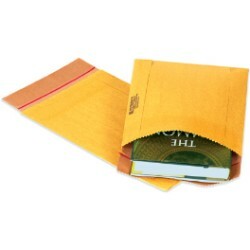 Our extremely strong, cohesive self-seal flap take the worry out of mailing. The Jiffy Rigi Bag mailer comes fully equipped with an easy open tear strip and are sold in case quantities to save our customers money. Available in an assortment of sizes, from 7 1/4" x 10 1/2" to 14 1/2" x 18 1/2" , there is a size for whatever your needs may be. Top quality at low prices is what we offer and our deep discounts on bulk orders save our customers even more money.